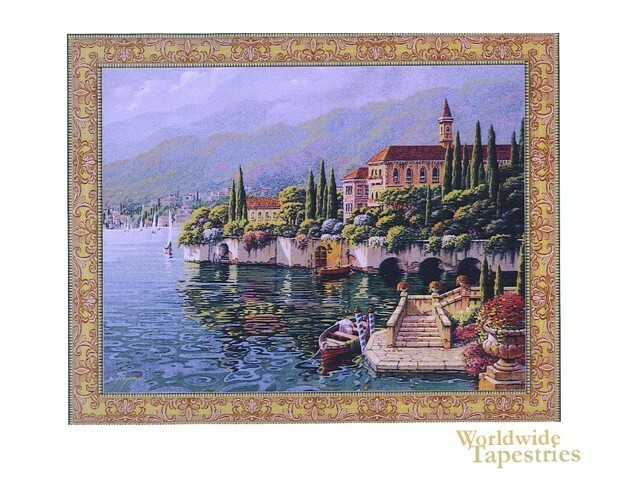 This tapestry shows a scene from Venera, the most heavenly region of Lake Como, Italy. Nestled in the mountain lake, this point in Lake Como has some of the most gorgeous villas in Italy and is surrounded by an abundance of gardens amidst the natural beauty of the water and the green lined mountains. We see a boat moored by a small jetty, the movement and reflections on the nearby water, and the misty play of light on the green mountains beyond. This tapestry "Verena Reflections" is backed with a lining and tunnel for easy hanging. Note: tapestry rod and tassels, where pictured, are not included in the price. Dimensions: W 48" x H 38"
Dimensions: W 62" x H 52"